Constellation francophone, an event highlighting the diversity of the country´s dynamic Francophonie, is part of the Canada 150 celebrations. A celebration of the many facets of the French language. Pan-Canadian Francophonie in six different cities. A beautiful constellation spanning Whitehorse, Winnipeg, Toronto, Ottawa, Dieppe, New Brunswick and Quebec City. A Francophone celebration in Whitehorse with Les Chiclettes, Sophie Villeneuve, Lisa Leblanc, Elisape Isaac, Lennie Gallant, Saratoga, Brigitte & Ryan, Ponteix and Soir de semaine. 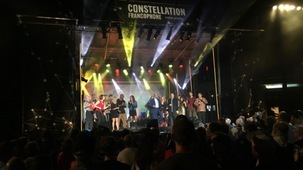 A Francophone celebration in Winnipeg with Geneviève Toupin, Laurence Jalbert, Marijo Thério, Jill Barber, Jacobus, Les Hay Babies, Pierre Kwenders. Francophone artists perform from Toronto´s Harbourfront: Roch Voisine, Renée Martel, Étienne Fletcher, Cécile Doo-Kingué, Joseph Edgar, Shauit, Wesli, Melissa Ouimet. A Francophone music extravaganza with Damien Robitaille, Joey Robin Haché, La Bronze, Le Paysagiste, Marijosée, Alexis Normand, Karim Ouellet, Stef Paquette, Yann Perreau.